Our goal is to provide a fundraiser that will empower our community youth and senior organizations, as these organizations use the synergy of the Rotary Duck Race to raise funds for delivering their programs. Funds will be used to provide financial support to not-for-profit youth and senior organizations (such as PACs, Hockey teams, Arts groups, Dance groups, Softball teams, etc. …) and to Rotary youth and senior projects in the communities of Maple Ridge and Pitt Meadows. Our goal is to provide a fundraiser that will empower community youth and senior organizations like yours. This event will allow your organization to gain exposure in the community and will provide an exciting new fundraising opportunity. Funds raised by your organization through ticket sales will be used to provide financial support directly back to you. 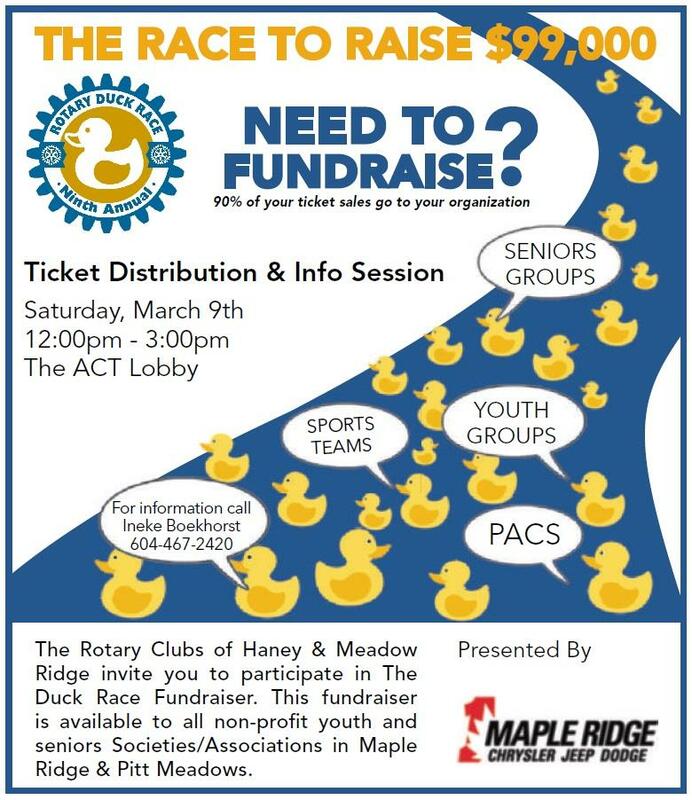 The Rotary Clubs of Meadow Ridge and Haney donate every buck from every duck back to the community (within the restrictions of our Gaming License) and your share will be a 90% proportion to the number of tickets you sell, with 10% going to KID SPORT so no child is left sitting on the sidelines. The Rotary Duck Race will allow your organization to gain exposure in the community and will provide an exciting new fundraising opportunity for your members. Our marketing plan includes over $20,000 in sponsored advertising that would not normally be available to individual organizations like yours. Your group will have access to many marketing tools like posters, flyers and newspaper ads – all produced by us. And you have the opportunity to participate in the event day itself – August 11, 2019 – where we expect an overwhelming crowd of duck-watchers. So … How can you get right to it? Tickets will be available for pick-up on March 3 and “duck adoptions” (selling of tickets) can commence. Our goal is to race 10,000 ducks with a $10 “adoption fee” for each duck (ticket) for a grand total of $100,000. By the rules of our license, we are limited to this total, so once the tickets are gone – they’re gone! Applications for funding and participation will be considered from any youth or senior organization in Maple Ridge or Pitt Meadows. All interested groups must provide a letter requesting they be considered for eligibility and must qualify under the Gaming & Licensing Branch rules. Organizations that receive funds in September must agree to use them for purposes deemed “eligible” (See “Guidelines – Applying for a Class A or Class B Gaming Event License). Organizations must also agree to report back to the Rotary Duck Race Disbursement of Funds Committee to verify funds were spent in accordance with the Lottery Regulations. If you have any questions, or if your organization would like to be considered for participation, please contact the Rotary Duck Race Organizing Committee for further details. We are happy to quack through the details anytime. Applications for funding and participation will be considered from any youth or senior organization in Maple Ridge or Pitt Meadows. All interested groups must provide a letter requesting they be considered for eligibility and must qualify under the Gaming & Licensing Branch rules. Organizations which receive funds must agree to use them for purposes deemed “eligible”. (See “Guidelines – Applying for a Class A or Class B Gaming Event License). Organizations must also agree to report back to the Rotary Duck Race Disbursement of Funds Committee to verify funds were spent in accordance with the Lottery Regulations. If your organization would like to be considered for participation, please contact the Rotary Duck Race Organizing Committee for further details. We look forward to racing with you!